Join VegNews Magazine and Vegan Epicure Travel for an unforgettable week of vegan decadence in The City of Light. Ooh, la, la … VegNews is going to Paris! Once again, we’re teaming up with the Paris pros at Vegan Epicure Travel for an unforgettable week of decadence in The City of Light. Relish the luxe side of the French capital with your expert guides, VegNews Publisher (and francophile) Colleen Holland and Vegan Epicure Travel’s Aurelia d’Andrea (VegNews Travel Editor, former Paris resident, and author of multiple books on Paris). Together, we’ll dine on elegant plant-based cuisine; sip expertly crafted wines; partake in cheese, chocolate, and pastry tastings; and savor the cultural extravagances this captivating metropolis offer. 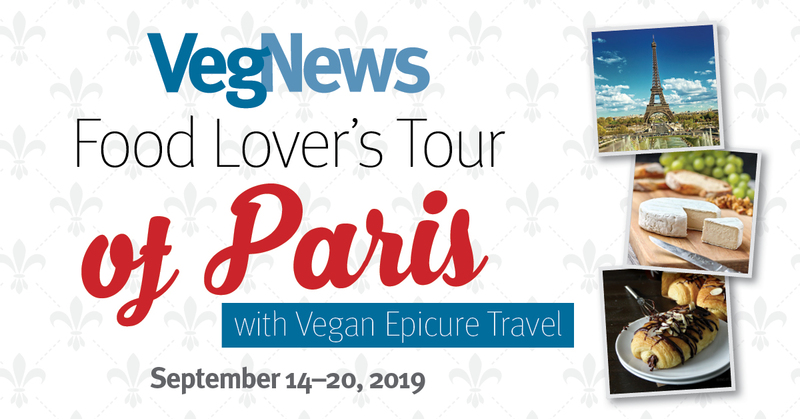 Download our VegNews Vegan Food Lover’s Tour of Paris flyer here! Price includes all meals, accommodations, activities, and gratuities. Only airfare is up to you. Traveling solo? No problem—many guests are! Come enjoy the magic of Paris with like-minded travelers from around the world, and then relax in your luxurious Single Suite at the end of the day. Want more information? We’re here to answer all of your questions! Simply email us at dreamparisgetaway@vegnews.com. Once you book your spot, we’ll send you a welcome package with everything you need to know.